Home » Dementia Symptoms: Is Lost Sleep A Sign? As per the statements of Centers for Disease Control and Prevention, sleep problems and insufficient sleep are global health epidemics. According to stats, 50-70 million American adults have faced sleep or wakefulness disorders at least once in their lives. This has affected their daily functioning, including work productively, driving, and even interpersonal relationships. In addition to physicians’ recommendation that when you eat well and do exercise you live a healthy life, experts also suggest getting a good night’s sleep for a healthy life. It is mainly because lack of sleep has been linked to some severe health problems such as depression, stress, weight gain, type II diabetes, and even cognitive dysfunction. Today, our focus will be the relationship between dementia and lost sleep. Though there is a lot of research which we should discuss, it is crucial that we talk about dementia and find out a few facts about what it is and how it affects people. Dementia refers to a mental disease which blankets several different pathophysiological conditions. Patients who are diagnosed with dementia may face several challenges such as memory loss: the cognitive dysfunction that worsens with time, and an inability to carry out daily activities. People plagued with dementia are also not able to socialize as they did before and can’t often receive or give emotional reactions. Though among the most common forms of dementia is Alzheimer’s disease, patients with vascular dementia, Lewy body dementia, Shy-Drager syndrome, alcoholic-related dementia and Parkinson’s disease also go through similar phases of dementia. According to stats provided by the Institute of Dementia Research & Prevention, 1 in 10 men and 1 in 6 women will suffer from dementia-related symptoms after they reach the age of 55. Among these, around 60-70% of these patients are diagnosed with Alzheimer’s later when the symptoms progress. One of the most prominent signs of dementia is sleep loss, and approximately 1/3 of the patients experience sleep disturbances such as sleep apnea and restless leg syndrome. So, our goal is to inform you about the connection between these two things so you too can benefit from the information. Before we begin and dive deep into the topic of the connection between these two things, it is imperative to understand that their relationship is inversely proportional. While some research shows that lack of sleep may cause dementia, others have studied patients with dementia that suffer from sleep issues and list it as a symptom. However, because the distinction between the two is challenging to detect, we will discuss some of the most prominent studies which have been conducted recently. According to a study that was led by Maiken Nedergaard of URMC’s Center for Translational Neuromedicine, insufficiency of sleep may lead to Alzheimer’s. The researchers involved in the research found out that the lymphatic system, which is also known as the waste-draining system, is ten times more active during sleep than it is while you’re awake. The reason why this cleaning system is so essential for you and your health is because it helps to remove the amyloid-beta protein, which is known to cause dementia and Alzheimer’s. Another research led by neuroscience professor Bryce Mander of UC Berkley along with William Jagust discovered that when you miss out on deep or non-rapid eye movement sleep, you may be leaving your brain vulnerable to memory loss, a symptom which is often associated with dementia and Alzheimer’s. The study, published in Nature Neuroscience also found that beta-amyloid is highly concentrated in the brains of people who consistently experience poor sleep. As the protein’s amounts rise in mind, it hampers your ability to sleep even further, and this results in a vicious circle that can further lead to severe problems in later life. 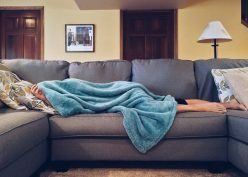 Finally, a study conducted by Adam Spira, an associate professor in the Department of Mental Health at Johns Hopkins University, along with his colleagues also found that there is a close connection between beta-amyloid, sleep disturbances, and dementia. The study was conducted on 70 seniors who reported their sleeping habits. With the help of PET scans, the scientists found out that the individuals who stated poorer sleeping qualities and shorter sleep duration had higher amounts of the amyloid protein in their brains as compared to those who stated otherwise. If you’ve always thought that insomnia is the only sleep problem that is faced by people, then you’re entirely wrong. The reality is that there are plenty of different types of issues such as sleep apnea, restless leg syndrome, periodic limbic movements, REM sleep behavior disorder (RBD) and sleep-disordered breathing which act as barriers in an individual’s sleep. Although most of these issues are related to old age, sleep apnea and RBD, however, are closely related to dementia. It is why we will dive in deep into both of these symptoms and find out exactly what they’re and how they’re presented in patients with dementia. In layman terms, sleep apnea is when an individual experiences a temporary loss of breath during sleep. Sleep Apnea can be categorized in two ways; the obstructive sleep apnea characterized by an obstruction in the upper airway and the central sleep apnea which happens due to issues in the central nervous system or cardiovascular region. Patients with dementia often exhibit signs of sleep apnea, which include chronic snoring and temporary loss of breath. Experts believe that this particular symptom is closely related to severe dementia and vice versa. According to stats, 90% people with moderate or severe Alzheimer’s experience 5 or more breathless events per hour of sleep and this can sometimes be fatal. Another symptom which is closely linked together with dementia is RBD. People who suffer from this disorder act out their dreams and physically move their limbs and sometimes even get out of bed and engage in activities that make them look like they’re aware. While sleeping talking is one of the most common types of this disorder, patients may even sometimes shout, scream, hit or punch during this dream-like state. RBD is used as a prognostic and predictive tool of the neurodegeneration in Parkinson’s. One of the most common misconceptions about sleep is that it is necessary for you to sleep for at least 7-8 hours straight to feel rested. What you have to understand is that it’s not the quantity of sleep that matters but the quality. It won’t matter if you lie on your bed at 11 pm and wake up at 6 am if you do not sleep and keep waking up intermittently. On the other hand, uninterrupted sleep for 6-7 hours is enough. Additionally, you have to remember that some people don’t need as much sleep as others. Such people can go about their day’s activities after sleeping for a mere 4-5 hours, and while others may be yawning their way through the day, they will remain active and alert throughout. Another thing you need to note is that resting at night isn’t the only way you’re going to get enough sleep. According to a paper by Roger Ekrick of Virginia Tech University, history suggests that you need to sleep in two distinct chunks of time. In his book ‘At Day’s Close: Night in Times Past,’ he referenced several 100 records from diaries, court records, literature and medical books and reported that people used to get at least 1-2 hours of sleep mid-day and completed the rest at night. What can you do to get more sleep? Patients who have Alzheimer’s or another form of dementia need to be taken care of, especially when it comes to sleeping and eating habits. If you’re someone who is caring for a patient with dementia, you can improve sleep quality through medication and treatment and bring the following steps in routine. Cut back on caffeine: One of the worst things that you can do with your sleep is to have caffeinated drinks such as coffee or tea before bed. Because these are stimulants that promote wakefulness, you need to ensure that you keep them away especially after the sun has gone down. Maintain sleep schedule: The brain is wired to function in the morning and rest at night. Unfortunately, with all the gadgets around us, it is often difficult to maintain a regular circadian pattern. Though it may take some time at the start, sleeping and waking up daily at approximately the same time will help you get into a habit. Don’t miss out on activity: Have you ever wondered why toddlers and kids go to sleep the minute they hit the bed? One of the reasons behind this is that children get a lot of activity throughout the day and play games that require them to engage in physical activity. When you make healthy and safe physical exercise a part of your loved one’s day, they will be likelier to sleep on time. Some studies have shown that there is a close relationship between sleep and dementia. If you think someone near you is suffering from the problem, then it is essential that you get a BrainTest Review and ask a qualified physician for the diagnosis. With proper care and medication, sleep disturbances experienced by people with dementia may reduce in intensity and number.